Anthony Joshua rolled into Cardiff, Wales to defend his versions of the Heavyweight World title on Saturday night. Matchroom Boxing presented an array of talent, to a near sell-out crowd at the Principality Stadium. The popular ‘AJ’, fought in front of 75,000+; cheers rang out and the sound of “Oh, Anthony Joshua!” made for an electric atmosphere. Frenchman Carlos Takam stepped in with less than two weeks notice. He entered the ring in great shape but visibly the much shorter man. Joshua is a unit and an imposing figure. 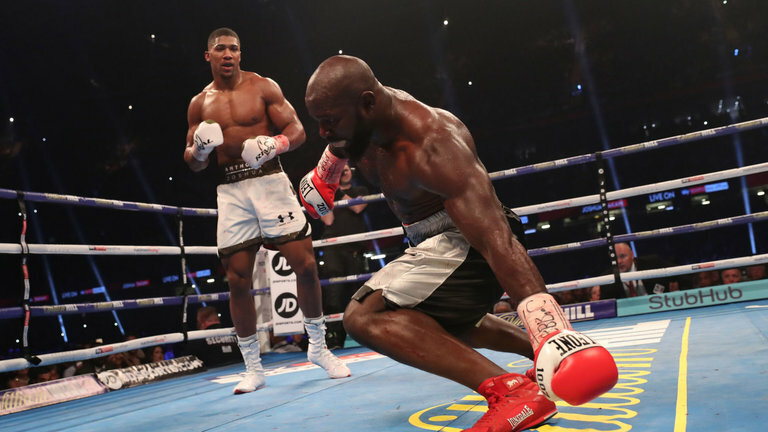 The fight started slowly, Takam looking to negotiate the dangerous early rounds, Joshua, seemingly, content to take his time. An accidental headbutt from the challenger, in the second, seemed to annoy and spur the champion into life, as he started throwing with violent intent. In the fourth, Takam suffered a nasty cut over the right-eye, matters got worse as he got dropped by a left hook. The fifth saw the champion putting combinations together well and it seemed just a matter of time. Takam is known for his toughness and durability and he showed it again in the sixth when he absorbed more solid shots. The seventh and the challenger was throwing more, and landing hard shots of his own. Joshua took a few, dropped his hands (as an invite) then launched his own attack. The pace had slowed by the eight and ninth, Takam, 36, having a decent round. The tenth was controversial. At the start of the round, the doctors were, once again, inspecting the Frenchman’s eye damage. Joshua started the round firing away, he landed a solid uppercut followed by a right, then referee Phil Edward’s jumped in and waved it off. Too premature though there’s no doubt, in my mind, that Joshua was winning the fight. Takam complained and he had good cause. Anthony Joshua on the ending, “I have no interest in what’s going on with the officials. I just worry about my opponent. Unfortunately, the ref stopped it. I think people wanted to see Takam unconscious on the floor, am I right? Overall, I thought Joshua fought to a plan and was negotiating the rounds well. He was breathing a little heavy, at stages, but wasn’t gassing out. Takam was a lot smaller and harder to hit due to his style. A tough man to take out and he had plenty of ambition. A good win for Joshua over a solid contender, who had been wrongly written-off beforehand. Anthony Joshua keeps his perfect record of 20-0, 20 KOs. Carlos Takam’s record is now 35-4-1, 27 KOs. Khalid Yafai, 28, took on Japan’s Sho Ishida, in defense of his WBA World Super Flyweight title. An intriguing contest that never really caught fire, due to the tactics employed. Ishida, 25, enjoyed a good height advantage, while the edge in speed was with the Birmingham boxer. It took a couple of rounds to get going, the challenger looking to counter rather than initiate the action. The champion was looking to assert pressure through-out. Overall, Ishida was a bit too negative and didn’t take the initiative. The official scores were: 116-112 x 2 & 118-110, all in favour of Kal Yafai. It was the second successful defense for the champion and his second challenger from Japan. His record improves to 23-0, 14 KOs. Ishida, of Osaka, tasted defeat for the first time. He’ll have gained considerable experience, with this being his first World title challenge plus his first fight away from Japan. His record drops to 24-1, 13 KOs. Ireland’s Katie Taylor, 31, lifted the vacant WBA World Female Lightweight title. She defeated Argentina’s Anahi Esther Sanchez, 26, who had already lost the title when she failed to make weight. Taylor was sharp and quick through-out. Sanchez could only match her for toughness. The contest went the full ten rounds, with the three judges all scoring it 99-90 in favour of the new champion. Katie Taylor remains unbeaten at 7-0, 4 KOs. Sanchez record falls to 17-3, 9 KOs. Londoner Frank Buglioni made a second successful defense of his British Light Heavyweight title. His opponent, Craig Richards, stepped in at late notice when Callum Johnson withdrew. The defending champion was methodical in pressing forward, he had plenty of success when working Richards against the ropes. The challenger has skills but didn’t have enough pop, to stop the champion coming forward. Both men are former super middleweights but the strength was with Buglioni, 28, who bossed the action and emerged a clear winner on the cards. Richards, 27, handled himself well, went the full twelve for the first time and will have learned from this step-up in class. Frank Buglioni won by scores of 117-111 x 2 and 116-113 and in doing so won the Lonsdale belt outright. His record is now 21-2-1, 15 KOs. Craig Richards record drops to 10-1, 4 KOs. Robert Helenius, 33, entered the ring to the Vikings TV series theme tune, which sounded very eery in a stadium. It was followed by the Jaws film theme music, for Dillian Whyte’s entrance. The vacant WBC Silver Heavyweight title was up for grabs. Not a belt that means you’re a champion but a belt to go with an eliminator. Both men have worthy credentials and I was looking forward to seeing how it would unfold. Dillian Whyte, 29, for the most part, put in a steady, mature performance. The left jab and body attack working well. Only occasionally, did he launch wild right hands. Helenius seemed content, on the back-foot, and never really threatened. It was by the third round that Whyte had started to close the gap and was fighting in range. Dillian was the one applying pressure, Helenius defending attacks rather than launching many of his own. By the ninth, the Scandinavian boxer had a bloody nose and Whyte was having things all his own way. The taller man, from Finland, seemed content to navigate his way to the final bell, while Whyte wanted to exchange fireworks. The official scores were 119-109 x 2 and 118-110, all in favour of Brixton’s Dillian Whyte. His record improves to 22-1, 16 KOs. Helenius suffered defeat for only the second time, in his career, his record now reads 25-2, 16 KOs. The only Welshman on this bill, in the Welsh capital, lightweight Joe Cordina put in an impressive performance. His bout preceded the main event, though, strangely, wasn’t shown on Sky Sports Box Office live. He faced the game Nicaraguan Lesther Cantillano, who was a few inches shorter. 25-year-old Rio 2016 Olympian, Cordina was fast, sharp and threw punches in bunches. He looked like he was going to overwhelm his foe but it went the full four rounds. Cantillano was dropped in the second but beat the referees count. Only the referee, Martin Williams scored the bout and he rightly had the Welshman a clear winner at 40-35. Joe Cordina, now competing as a lightweight, has a perfect record of 5-0, 4 KOs. Cantillano, the first to last the distance, has a record of 3-9, 2 Kos. In a light heavyweight contest, Croydon’s Joshua Buatsi faced France’s 33-year-old Saidou Sall. It was an impressive display by Buatsi, he mixed his shots up well, plenty of variety. He looked in control at all times, Sall employed a high guard and tried to impose himself on the fight, in the third, but Buatsi, 24, was just too good. Uppercuts, triple hooks, bodywork – the Rio 2016 Olympian Buatsi showed a bit of everything. Sall was game but down in the final round. He beat the count and just as referee Martin Williams was about to wave it off – timekeeper Dave Walters’ bell rang to signal the end of the contest and save the Frenchman. The referee scored the bout 60-54 to Joshua Buatsi, who is now 3-0, 2 KOs. Saidou Sall’s record drops to 10-7-2, 4 KOs. The show opened, with another Rio 2016 Olympian – Lawrence Okolie. The Hackney, London boxer took on Manchester’s Adam Williams. Okolie controlled the action, using a good orthodox jab. The bout ended in the third, Okolie was having success with body shots but downed his man with a left-right combination to the head. Williams bravely beat the count but referee Reece Carter correctly called a halt to proceedings. The corner were ready with the towel to save their outclassed fighter. Lawrence Okolie remains undefeated at 6-0, 5 KO’s. Williams is now 1-2.